Facts and history about the life and lifestyles of Native American Indians. A Pow-wow is a term that is commonly used to describe a gathering or meeting. The word originated from Native American Indians when they attended important ceremonies, tribal dances, feasts and sacred rituals. The Pow-wows were organised by Medicine Men and the spiritual leaders of the tribes. As Native Americans began to associate with Non-Indians, important meetings, or Pow-wows, were organised to negotiate the terms of peace treaties. As many as 5000 Native Americans were known to attend such occasions and Pow-wows required meticulous planning and organisation just as they do in the present-day. The life, history and lifestyle of Native American Indians is a varied and fascinating subject. The following fact sheet contains interesting facts and information on Pow-wow. 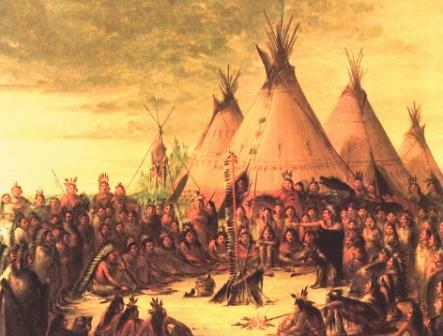 Pow-wow Fact 7: A Pow-wow was often attended by members of many different tribes, some old enemies, so it was vital to keep order to ensure the success of the event. Pow-wow Fact 9: The head organiser was often referred to as the 'Whip Man' and his regalia included a small braided whip. The Whip Man held considerable responsibility and his ominous title probably dates back to the first role of the Whip Man - that of the punisher. The role of the 'Whip Man' still exists in modern Powwows and he uses his whip to point at any flagging dancers. Pow-wow Fact 10: The circle is an important symbol to Native American Indians being symbolic of the life cycle. Many Pow-wows were organised in a series of circles. Dancing took place in the center of a circle which formed by the drums and important members of the audience. The spectators formed another circle around the gathering.